This is not a post about the OUP reading scheme. No. My reading trees are more of the green and leafy variety. As I sit now, watching the last leaves of autumn fall, I remember the sinking feeling I used to get as a child at this time of year, when I realised that my reading trees - a solace and refuge - would have to be left till the following spring. Naked and bare of foliage, they were no longer places I could hide with a book. In these less agile days of middle-age, I prefer a slung hammock, but when I was younger and bendier, climbing trees with a book was my perfect escape from weeding the strawberry beds, or lugging bales of straw and slopping buckets of water over countless fields, or any other undesirable job my parents could dream up for an idle, book-loving child. My first climbing choice of inside the laurel clump made a springy green cave smelling of rich, rotting evergreen humus and was not terribly satisfactory as a perch, being rather unstable and drippy when it rained, as well as dark and bad for the eyes. The Victoria plum tree was good in the spring and early autumn but not in the summer when the wasps attacked the ripening plums and anything else in reach. It was also, latterly, near the bonfire, which meant that I read with smarting, smoke-filled eyes when the wind was in the wrong direction. The right hand of the twin chestnuts on the boundary had a wide horizontal and almost flat branch which was great for reading and also for lying and spying on the house (and on the next-door neighbours in their thatched cottage), hiding me from sight entirely. But when new neighbours moved in, less short-sighted and tolerant than old Mr and Mrs Smith, Complaints Were Made, and I was banned from climbing it on pain of dire punishment. A nosy child (I confess I did have a pair of binoculars on occasion) was not welcome, despite my protestations of innocence and the waving of books as proof. It was the old cherry in the part of the garden where nobody went, just by the dogs' graves, which was best. That was where I stashed my rope ladder, and found a perfect snug fork just at the right angle for leaning against. It was there that I devoured R.M. Ballantyne's The Coral Island as well as Swiss Family Robinson, (the latter being especially suitable for treetop reading) among many others. The lullaby of the creaking branches, the wind, the rustle of pointed leaves, the occasional adventurous woodpigeon or little brown bird landing above my head, these were the sounds that informed my early reading life. Hammocks are good, but trees are the real thing. Love this. 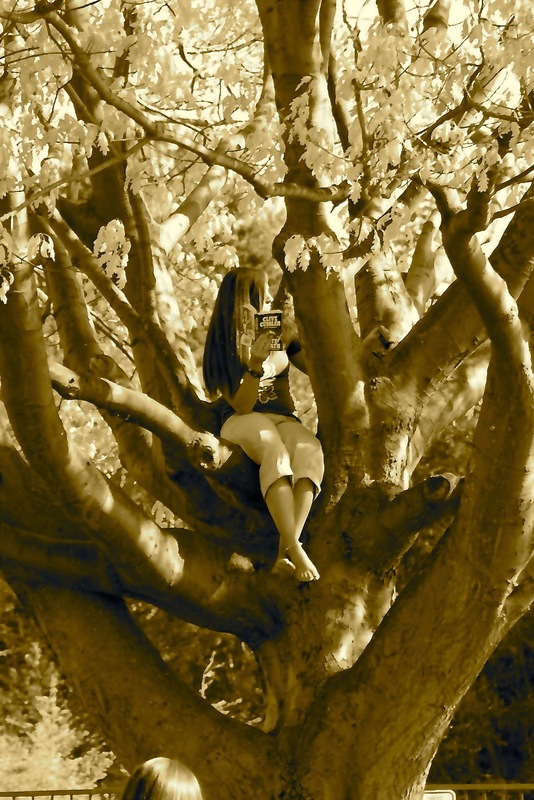 I also loved climbing and reading. My best trees were an olive (in Italy), a plum and an apple. The plum meant I forever associate Little Women with stomach ache. Oh no! What a shame, Amanda. I associate it with warm crumpets and tears. But I'm delighted to find another tree reader - we're a rare breed! I was never any good at climbing trees but the idea of a little treehouse just for me still seems utterly desirable!